Eliquis (generic name: Apixaban) is a drug which is prescribed for the prevention of venous thromboembolic events (VTE) in adult patients who have undergone elective hip or knee replacement surgery. A venous thrombosis is a blood clot that forms within a vein. Thrombosis is a medical term for blood clotting (Haemostasis) occurring in the wrong place, i.e. a thrombus forming on the inside wall of a blood vessel. Eliquis is the only oral anti-coagulant with a 12 to 24 hour post surgery initiation window, which may help physicians to observe and stabilize post-surgical patients before beginning treatment. Eliquis is dosed 2.5 mg twice daily, requires no routine platelet or liver monitoring, and requires no dose adjustment in indicated patients. In patients undergoing hip replacement surgery, the recommended duration of treatment is 32 to 38 days. In patients undergoing knee replacement surgery, the recommended duration of treatment is 10 to 14 days. Hip and knee replacement surgery is common among the over 60s as wear and tear on joints can cause damage to the bone, which can lead to pain. Canada Drugs Online is proudly to serve you branded Eliquis from Canada manufactured by Bristol-Myers Squibb. We also carry the same brand Eliquis comes from also countries such as India and Turkey. Please call our toll free at 1-877-900-3784 for details. CanadaDrugsOnline.com supplies only genuine Eliquis from Canada, Turkey and India shipped using Canadian, Turkish and Indian packaging. 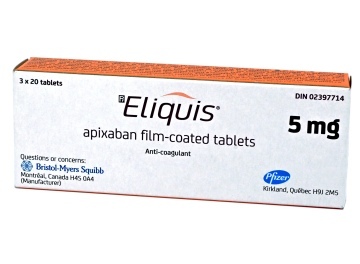 This Eliquis is manufactured by Bristol-Myers Squibb the worldwide manufacturer of Eliquis. This offer is neither endorsed nor authorized by Bristol-Myers Squibb (the United States and Canadian distributor of Eliquis). CanadaDrugsOnline.com has no affiliation whatsoever with Bristol-Myers Squibb. CanadaDrugsOnline.com also carries other anti-coagulant medications and Canadian drugs such as Pradaxa and Ventolin. As with any drug, there may be side effects from taking Eliquis including anaemia, hemorrage, confusion, nausea, abnormal bruising or bleeding and stomach pain. If you experience any side effects you must seek medical attention immediately for safety. You should follow the instructions of the doctor who prescribed Eliquis to you. Directions and dosage information can also be found on the pack or leaflet inside the pack. Eliquis comes in tablet form. Do not crush, break or chew tablets as this can cause for too much of the drug to be released at once, which could cause undesirable effects. Eliquis should be stored at room temperature away from direct sunlight and heat. If you are allergic to any of the ingredients of Eliquis, you should avoid taking it and inform your doctor. You must consult your doctor if you have any pre-existing medical conditions including any allergies, bleeding or blood disorder, infections, kidney or liver disease, and stomach ulcer. You must consult your doctor if you are taking any other medications as they may interact with Eliquis, including NSAIDs, other blood thinner medications and warfarin. It is important that you inform your doctor if you are pregnant, planning to conceive or breastfeeding as Eliquis may cause harm to unborn and new born babies.